Nearly one year ago, Kansas City celebrated the opening of the KC Streetcar with much fanfare and pride. In that time, we’ve completed more than 1,959,801 million trips with a daily average ridership of 5,860 in 2016. Now it’s time to celebrate this momentous year with a good, old fashioned birthday party. Join us, and our special guest, Mayor Sly James, at a community birthday party on May 6, 2017, from 11:00 a.m. – 2:00 p.m. The festivities will take place outside at the Union Station Transit Plaza. There will be music by DJ Kemet “The Phantom” Coleman, Food Trucks, games, face painting by Sister Act, an interactive art activity by Grapes & Paints, mascots from the KC Chiefs, Sporting KC and UMKC Athletics, artists with Art in the Loop, special edition streetcar merchandise by MADE Urban Apparel, a Touch-A-Truck activity area for kids hosted by RideKC and the City of Kansas City, Missouri, and, of course, sweet desserts and BIRTHDAY CAKE provided by Bloom Bakery, Opera House and Insomnia Cookies, bakeries all located on the KC Streetcar route, plus so much more fun! 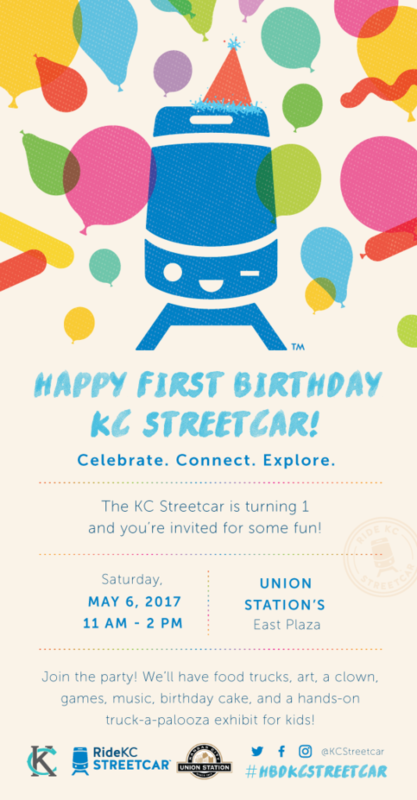 Bring the family, friends, kids, neighbors and dogs and wish the KC Streetcar a very Happy Birthday.